When you have a baby it really feels like you're walking into a totally new world. You don't feel the same, mentally or physically, the hues of the world are slightly different, your food tastes and smells a little off, and sometimes words just don't compute in your head right. It takes a second longer to process what people or the TV or radio is saying, it can take even longer to process what you're reading. Suddenly you're a traveler in this new land, but this time not alone: you have a tiny sidekick along for the ride, and while often that makes the journey more fun and exciting, most of the time it simply makes the journey tiring, scary, and stressful. I entered into this new world with the love and support of my family and friends behind me. They cheered me on as Weston and I donned our travel supplies and headed out into the new world together; however, as much as everyone around me loved me and wanted to help us on our new ventures, sometimes it felt like we were just two souls traveling on our own. There were so many instances that seemed so unique and made me wonder, "is this normal?" As I would lie in bed at night, a wriggly newborn next to me, I would close my eyes and think about the path ahead of me...it seemed daunting, but doable. I thought about my son, by my side...and I realized that the journey with Weston would be amazing, but I would love to have had some people to sojourn with us. However, the winter was cold, I was feeling super gross in my sweaty post-maternity clothing, and the thought of taking a tiny baby out to make mom friends was laughable. But, as time went on, and winter turned to spring, we started venturing out into the real world, and slowly, we made some friends. New moms who were on their own scary journey. As we would come across these women and babies, we would smile, nod, and sometimes pass on the street, but often, stop to chat. As we got to know these moms and babies, there was a great relief of finding others who knew what I was going through at that exact moment in my life. Oh, you're not sleeping either and are running on caffeine fumes? Oh, you have to see another annoying doctor, too? Oh, you started solids and the baby gagged and threw up all over, too? There was a camaraderie forming between some of the moms we came across, and I soaked it up. I loved knowing that these women were also up late rocking babies, stroking hair, and making bottles. I loved knowing I had teammates in this crazy game of parenthood. The women I came across may not have lived the same life I have, but there was one thing we all had in common: we were all mama. I'm not sure if you've noticed, but there's a new trend in the mom-world to hark back to the "mama" title....and not just for the babes to call their mothers. 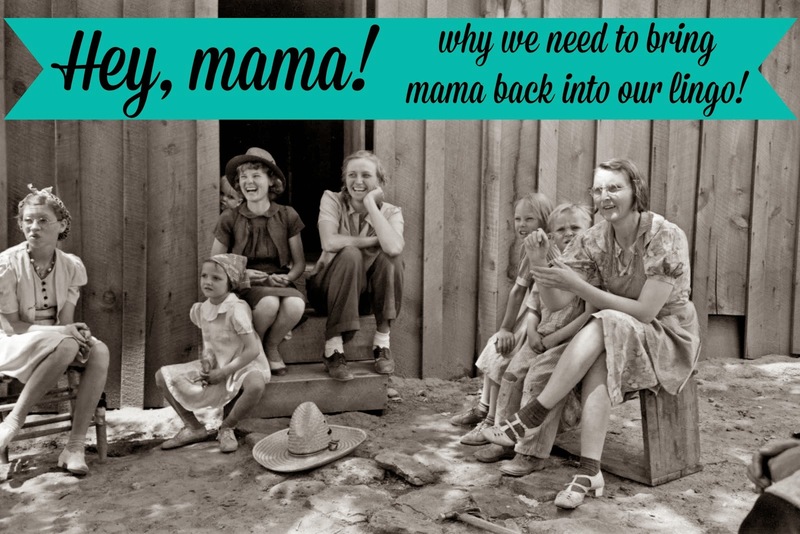 I'm talking about the mom-to-mom communication: mama is making a comeback, and I love it. See, when you meet a new mom, and you throw your sweet, innocent three month old under the bus, "this kid never sleeps a wink, he's driving me nuts!" even if the mom you met just met you and has no clue what your name is, she can simply say, "oh, mama, that's so tough! I am so sorry!" Or, you're at the doctor and your baby is screaming, another mother may turn to you and say, "been there, mama, and it's the worst!" Mom and Mommy can be slightly off-putting and condescending, but there's something so sweet about mama; so old fashioned, calming, and even slightly silly. I'm a huge fan of mamas helping mamas get through these crazy times, and by bringing back "mama," we're allowing women to generate their own villages, even just upon meeting another woman for the very first time. Mama is reassuring, it's comforting; it's putting a hand on the shoulder of the woman you just met and saying, I've been there, we've all been there, and you're going to get through this. Mama is the sweet smile to a confused mom, or the open door to the mom of twins struggling with the giant stroller. Mama is the motioning for a new mom to sit next to you at music class, or the introducing yourself to a nervous looking mom at the playspace. Mama is inviting a new mom, just as you are, to pull on her boots, strap her baby to her chest, and join you on your journey. Your paths may not always be parallel, but for that moment in time, you mamas can sigh together and understand what the other is going through. My friends and I are using "mama", but I had no idea it was a thing. I love this! It fosters such a feeling of camaraderie.